The Sonos Playbase all-in-one speaker system is designed to be paired with a TV, so it’s ironic that it sounds better with music than it does with movies and television shows. Maybe that’s because low-end frequencies are more prevalent in music than they are in soundtracks—even in action films. Don’t get me wrong, the Playbase sounded vastly superior to the speakers built into the two flat-screen TVs I tested it with: a 55-inch Panasonic Viera TE-55LE54 and a 43-inch Vizio M43-C1. As well it should considering it costs $699. If you’ve already committed to the Sonos ecosystem, the Playbase is a no-brainer of an add-on if you’re looking for a single-cabinet home theater sound system. It’s just that the speaker lacks the gut-punching bass response you want to hear with movies. To get that, you’ll need to pair the Playbase with the wireless Sonos Sub—but that will set you back another $699. And when you get into that price range, there are more feature-rich products on the market. If you do go down this path, I heartily recommend taking advantage of Sonos’ Trueplay speaker-tuning software, as it significantly improved the speaker’s performance with both movies and music. That, however, requires that you have at least temporary access to an iOS device (I used a 5th-generation iPod touch because I use an Android smartphone). The software is not available for Android due to that platform’s diversity (different microphones, different ways of processing audio, etc.). The Playbase can support TV’s much larger than this 55-inch Panasonic LCD. It can support up to 75 pounds with no problem. Having said all that, the subwoofer is less essential with the Playbase than it is with Sonos’ other home theater speaker, the Playbar. The Playbase’s larger enclosure allowed Sonos’ engineers to put in a much beefier woofer and a long, snaking port that does a really good job with low frequencies. When I reviewed the Playbar, I found myself craving a sub for both music and movies. Another area where the Playbase left me wanting was surround sound. 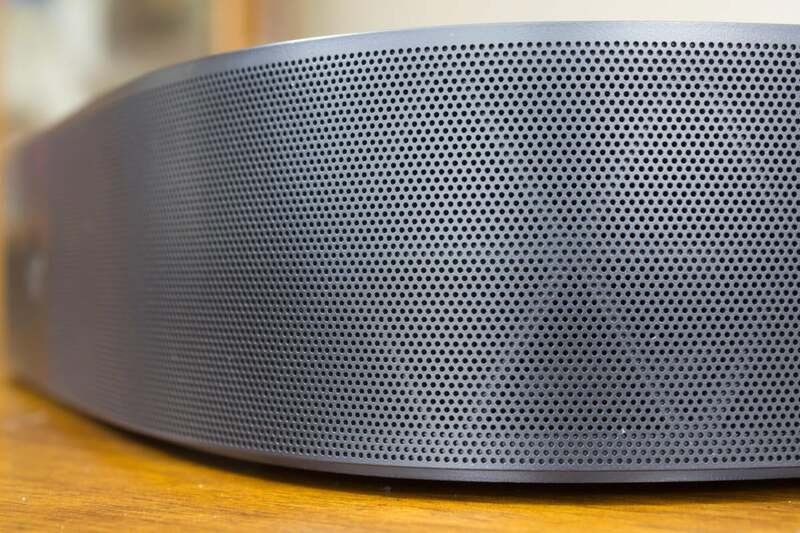 This speaker can easily fill a room with sound, and it can decode a Dolby Digital bitstream, but you’ll need to add discrete surround speakers (a pair of Play:1s, for instance) and the Sonos Sub if you want genuine 5.1-channel home theater sound. You won’t get that effect at all with the Playbase alone. There’s no support for DTS; or the higher-resolution bitstreams introduced with Blu-ray (Dolby TrueHD and DTS HD Master Audio); or the object-oriented codecs Dolby Atmos, DTS:X, and Aureo 3D that add the element of height to your speaker array. If any of those features are on your must-have list, you should probably look at one of Yamaha’s higher-end digital sound projectors (and Yamaha’s MusicCast is a very good multi-room audio solution). Sonos is very proud of the holes in the Playbase’s grill. The company says they’re drilled in various diameters to render the grill acoustically transparent. The Playbase’s cabinet is astoundingly thin—just 2.28 inches high—for the amount of sound it puts out. It measures 28.35 inches wide and 14.17 inches deep and is strong enough to support TVs weighing up to 75 pounds (my 55-inch Panasonic weighs 59.6 pounds, so the Playbase shouldn’t have a problem supporting a much larger TV). 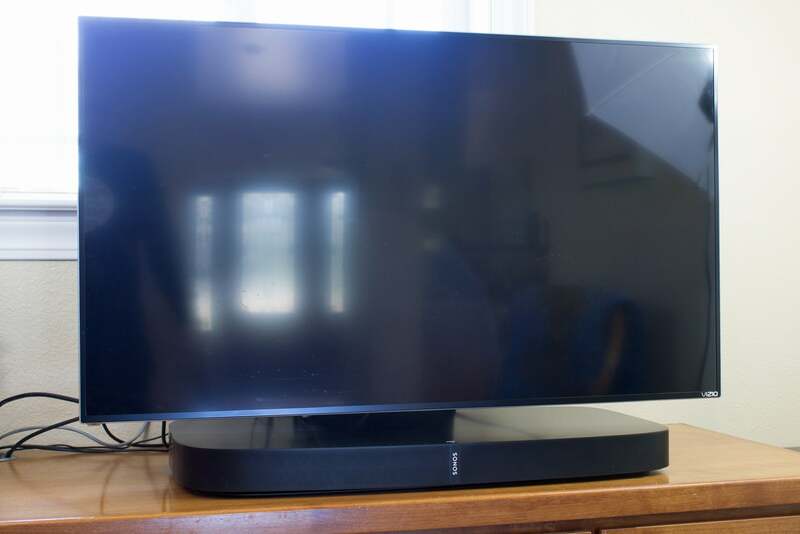 I also tested the speaker with my Vizio TV mounted to a new swiveling TV stand from Sanus that was designed with the Playbase and the Playbar in mind: It holds up to a 60-pound TV in a manner that makes it look as though the TV is floating above the speaker. The only way to get your TV’s audio to the Playbase is via a Toslink cable. If you have multiple HDMI sources (a cable box, a streaming box, and a Blu-ray player, for instance), but your TV has only one HDMI input, the Playbase is going to be a problem. And since there’s no HDMI input, there’s no support for CEC (Consumer Electronics Control), ARC (audio return channel), or any of the other features that HDMI offers (including the bandwidth needed for the aforementioned high-resolution audio codecs). The Playbase can, however, learn the code from whatever remote you use with your TV to adjust the volume. 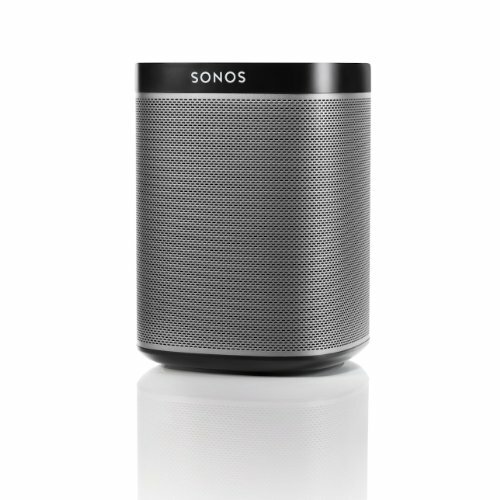 And if you’re using the Sonos app on a smartphone or tablet, you can use that device to control the volume. If none of those devices are in reach, you can use the touch-sensitive buttons on the speaker itself (there are also play/pause and track-forward/back buttons on the cabinet) when you’re listening to music using the Sonos app. 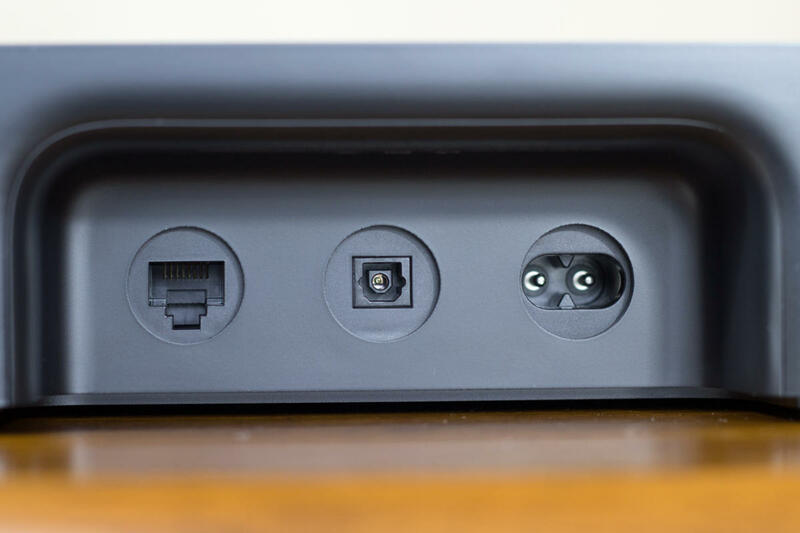 The Playbase has just three connectors: Power, Toslink (for audio), and ethernet (though most people will use a wireless network connection). If you were to open the Playbase’s glass-filled polycarbonate enclosure, you’d find six 2.0-inch midrange drivers, three 1.0-inch tweeters, and the aforementioned 5.25-inch woofer, each of which is powered by its own dedicated Class D amplifier (10 in all). Sonos never publishes its amplifier specs, but you needn’t worry that the Playbase is underpowered. It had no problem filling my 245-square-foot home theater with sound. It proved equally capable when I moved it into my kitchen, which adjoins my great room in an open floorplan. There’s 708 square feet of space between those two rooms. George Miller’s Mad Max: Fury Road will give any speaker system a workout. The film could be described as a two-hour car chase, but with monster trucks. With engine noise, explosions, gun shots, or the sound of rending metal in almost every scene, it can be difficult to make out what little dialog the characters engage in. That wasn’t an issue with the Playbase, but I missed the sense of being in the center of the maelstrom. No matter where the action was happening on the screen, the sound accompanying it was coming at me only from the front. In addition to the Trueplay room EQ feature, the Playbase has two other audio-processing features: Speech Enhancement and Night Sound. The former automatically boosts frequencies associated with voices. That necessarily results in some sound effects also being amped up, but it works well with all types of films, ranging from action flicks like Mad Max to talk-fests like The Big Short. Night Sound mode is for those times you want to watch TV when the rest of the household has gone to bed. You can lower the overall volume and Sonos’ algorithm will render dialog more clearly while reducing the intensity of sudden loud sounds. Personally, I prefer using wireless headphones in those situations, but Sonos’ solution works. 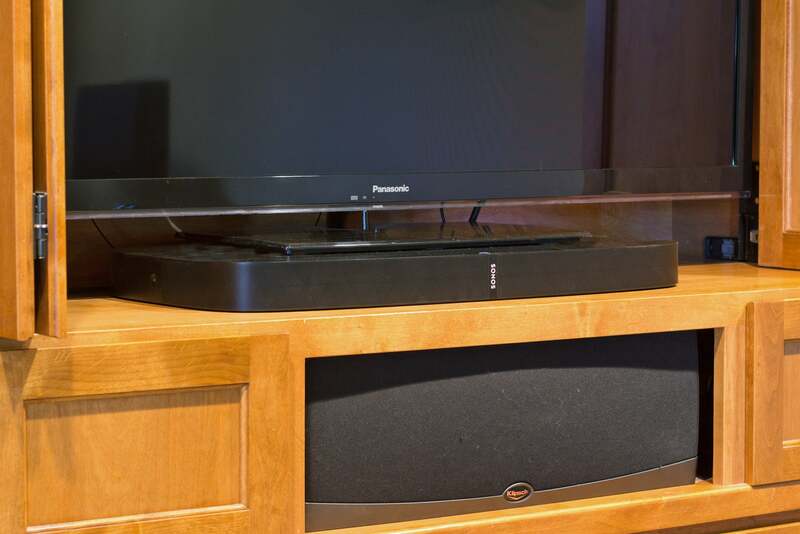 In this shot, the Playbase is paired with a 43-inch Vizio LCD TV that’s mounted to the new Swiveling TV Base from Sanus, which creates the illusion of the TV floating over the speaker. The Playbase isn’t excessively directional, and I had no issues hearing dialog while I was sitting off-axis to the speaker, but the speaker definitely rewards those who sit in its sweet spot. The closer you can sit to that sweet spot, the more you’ll enjoy listening to music on the Playbase. Distinct stereo separation on the title track of Donald Fagen’s The Nightfly enabled each instrument in the backing band—from the pulsing synth to the pounding cowbell—to make its presence known without smothering Fagen’s sneering vocals and the sweet chorus backing him up. Any all-in-one speaker system is a compromise. You’ll trade the excitement of true surround sound for the convenience of easy connectivity and a much simpler footprint. If those tradeoffs are acceptable, the Sonos Playbase is one of the better products in its class and movie soundtracks will sound vastly superior on it compared to the speakers built into your TV. The Playbase is also a great speaker for filling large rooms with music; in fact, I think it’s an even better music speaker than it is a TV speaker. If you do want an authentic 5.1-channel surround system, you can add additional wireless speakers and a wireless subwoofer to the Playbase. But that will entail spending at least another $1,099 dollars on top of the $699 for the Playbase itself. And you’ll be topped out at that point: You won’t be able to expand to a 7.1-channel system (with a pair of rear surround speakers) or a 5.1.2-channel system (with a pair of height speakers that can take advantage of something like Dolby Atmos). Again, you might not ever want to do that anyway. Different strokes for different folks. 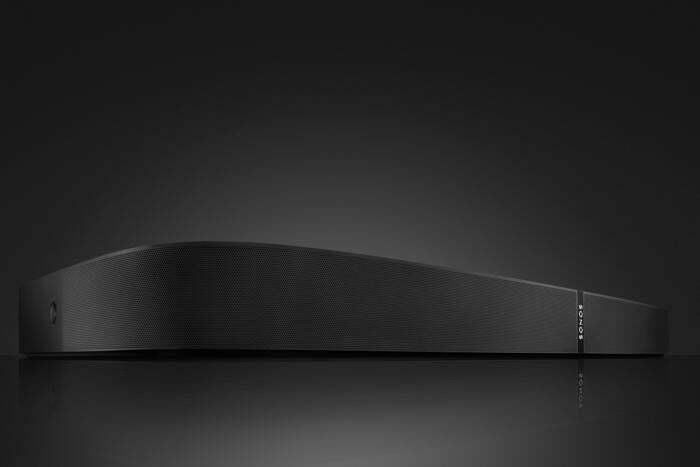 The Playbase isn’t the type of speaker I’d want for my own home theater, but it might fit yours to a tee.